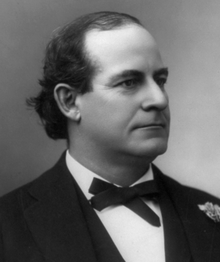 William Jennings Bryan (March 19, 1860-July 26, 1925) was an American politician in the late nineteenth and early twentieth centuries. He was from the Midwest. He is known for supporting causes that were not very popular or were old-fashioned, such as the silver standard or creationism. In the 1890s, he was a Congressman from Nebraska. He gained fame in 1896 for the "Cross of Gold Speech", a speech about the American economy he gave to the Populist Party. He ran for President as a Democrat three times, in 1896, 1900, and 1908, but lost each time. During this time, he was the main leader of the Democratic Party. He was one of the first people who gave lots of speeches around the country while running for President, and continued to give speeches even when not running on what was called the "Chatauqua Circuit". He was United States Secretary of State from 1913 to 1915. In his last years, he was one of the lawyers in the Scopes Monkey Trial. He is portrayed in the book Inherit the Wind by the character Matthew Harrison Brady.